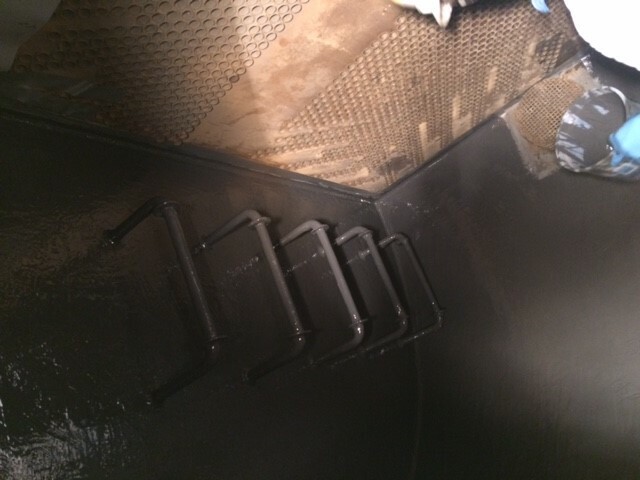 First, our team had to blast and coat each water box. After 20 years, the ladder rungs had the most damage. 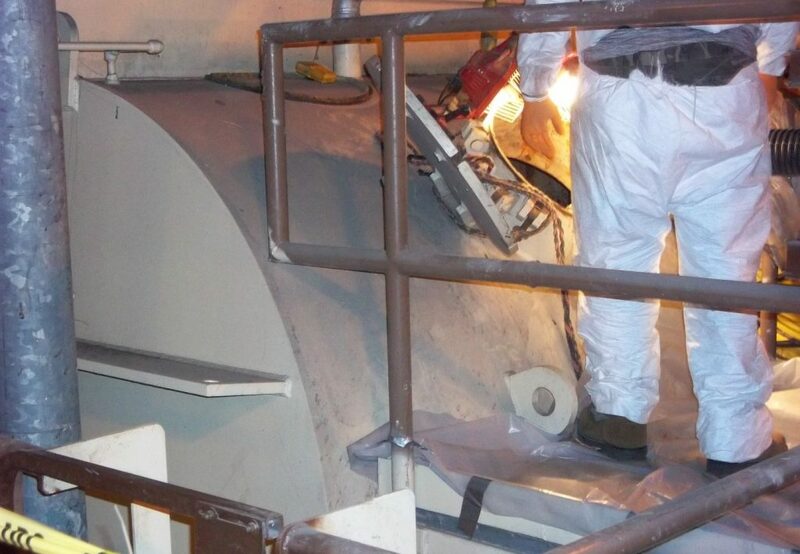 As a result, the plant personnel had to lay aluminum scaffold boards to stand and walk on while cleaning the tubes. 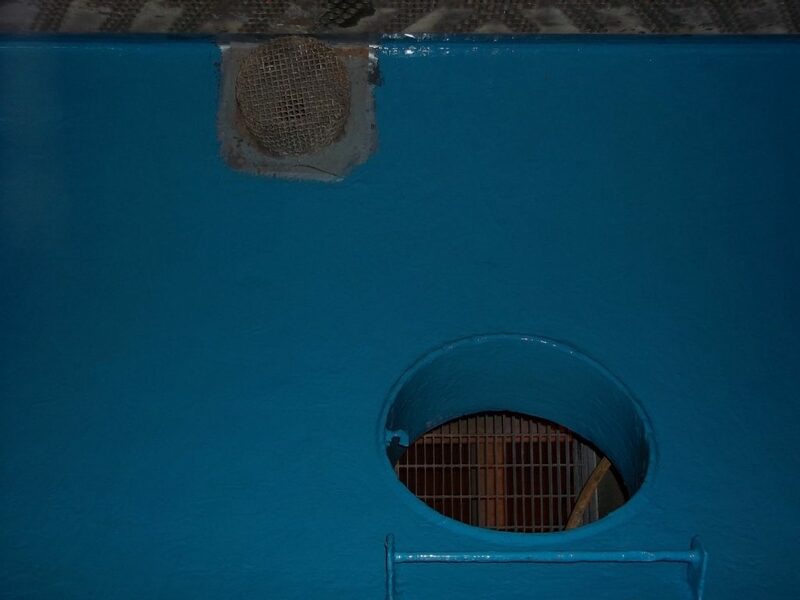 We first blasted the steel surfaces using an angular anchor pattern at 3-4 mil with NACE Standard #2 SSPC-SP10 Near-White Metal blasting level to clean the area. There were areas that had slight metal loss, which is mostly a result from cold wall blistering. Water comes in from a cooling tower with temperatures of 90-98°F. Then, it leaves to go back to the cooling tower at 115-125°F. PES 201 Ceramic Repair Paste is used to build the areas with metal loss by restoring the surface. PES 201 is an alumina ceramic filled paste grade product that is trawled into place with a plastic applicator. PES 201 sets up enough to accept a coating 1 to 1.5 hours at 68-70°F. Then, we applied a coat of PES 202 Ceramic Repair Fluid (dark gray) by brush and roller at 15-18 mils. The first coating application was at 15-18 mils thick. 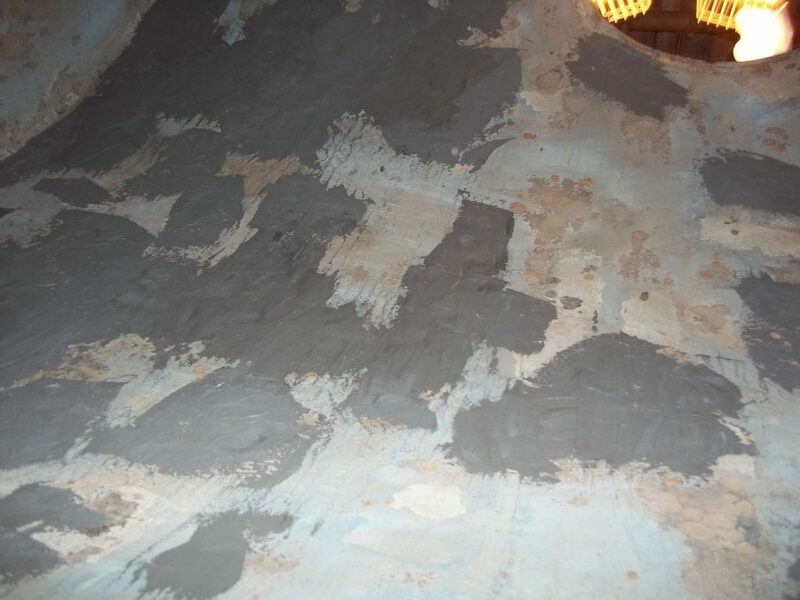 The first coat of PES 202 (dark gray) typically takes 2 hours to become firm enough to stick. Then, we applied the second coat of light gray also at 15-18 mils. 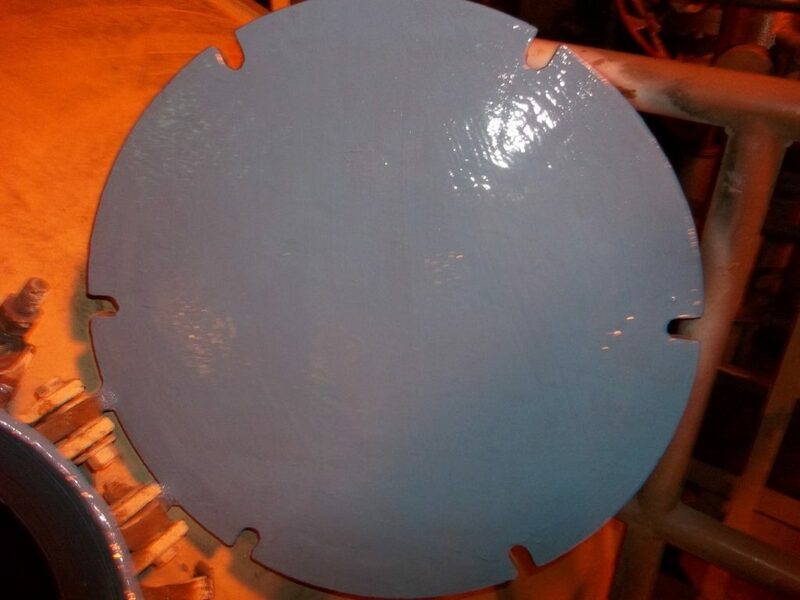 Finally, we applied a third coat of PES 202 brushable ceramics again at 15-18 mils. PES 202 Ceramic Repair Fluid is a two component solvent free epoxy metal repair fluid. 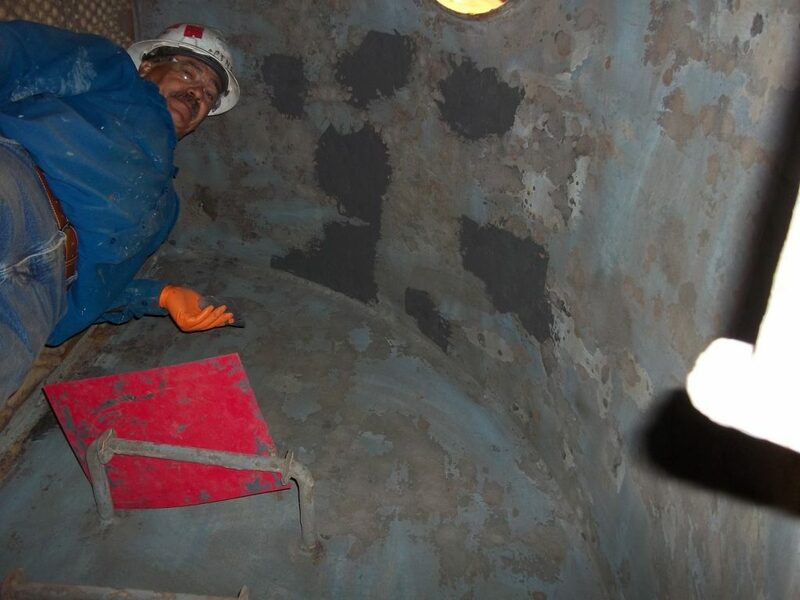 This product has been designed for use on a wide range of metallic surfaces subject to abrasion and impact. 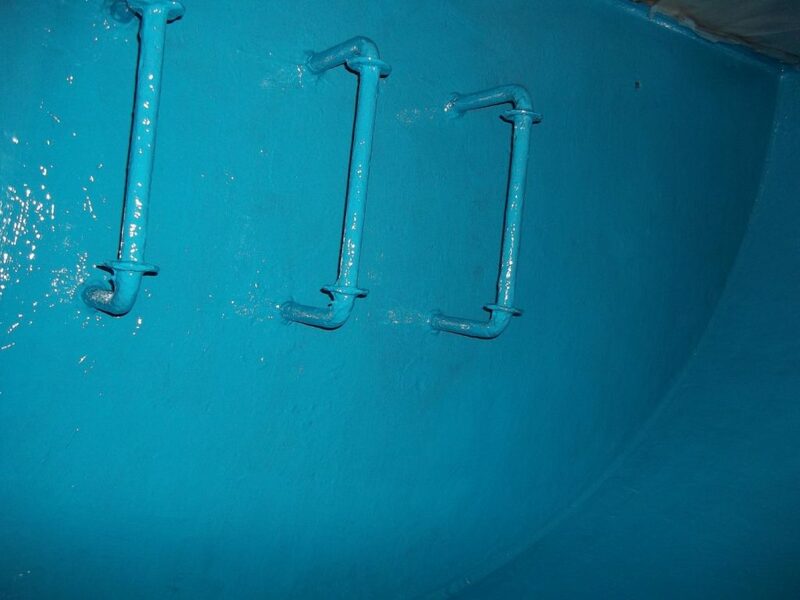 The product is suitable for emergency repairs or part of a planned maintenance schedule on equipment such as worn impellers, damaged valves, eroded separator housings, damaged pump casings, eroded pipe work, propellers, bow thrusters, corroded water boxes and eroded end plates and tube sheets. 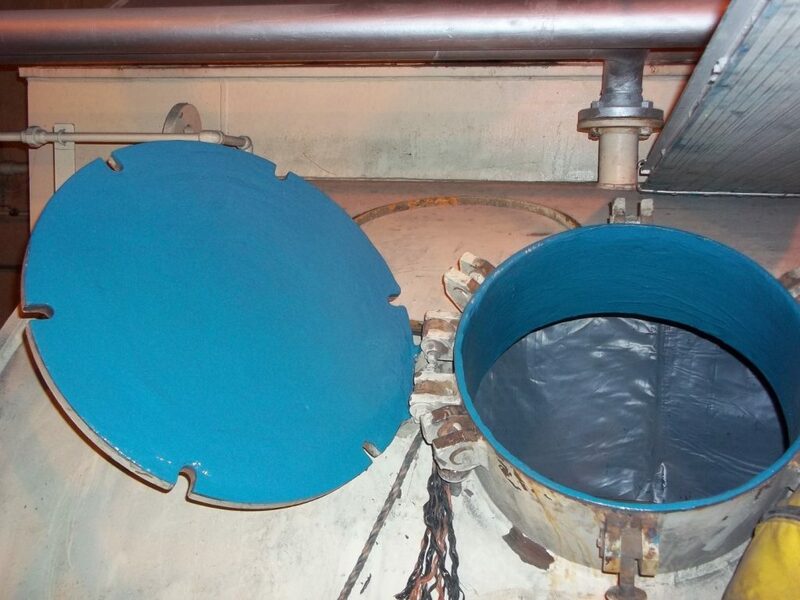 Here at PES, we design our products to offer repair and protection solutions to many industrial maintenance problems. Contact us with the link below for more information on our products! This entry was posted in Steam Condensers and tagged Main Steam Condenser Repair, PES 201, PES 202. Bookmark the permalink.